Rhythmania (originally DrumTech) was started in 2005 by Bonny Phillips and Neil Jourdan. Both had been using drums in schools not only as musical instruments but also as effective educational tools for a number of years. In July 2009 Neil unfortunately left Rhythmania as he was leaving South Africa to settle in New Zealand. The drum is an accessible musical instrument which learners from Grade R to secondary school can play and enjoy. More importantly the drum has far reaching social, cognitive and spatial benefits. Many of the learning outcomes for various grades are achieved through the action of drumming, rhythm and movement. 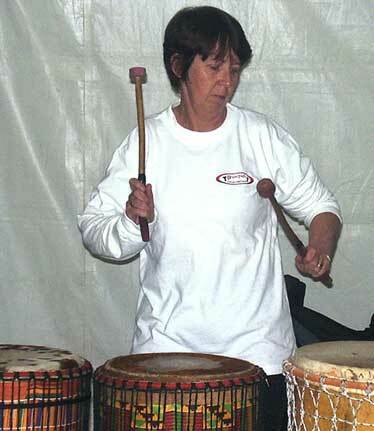 Various companies and groups provide once off interactive drumming where the drums are provided and a session (usually an hour) is facilitated. These interactive sessions are fun and uplifting but the effects are shortlived. The drum is most effective as an educational tool if used on a regular basis. Yet a problem exists: drums are expensive and many schools can’t afford them. Having only a few drums limits the drum’s social efficacy as hand drumming is essentially a group activity. It is on this basis that Rhythmania set about developing a drum which is cost effective, robust and has a good sound. The resulting drums are unique as they are in a kit format which the learners themselves can build. Along with the drums, Rhythmania started offering teacher training courses where teachers come and make their own drum, spend an afternoon learning about hand drumming, how it could be used in the classroom, numerous activities and the resulting benefits. These courses proved to be very popular and successful in 2006. Many schools purchased their drum kits and set about building and decorating them during their DT classes. Some schools opted to get the Rhythmania Team in to run a morning’s workshop where the team facilitated the drum building and some drumming with the learners. Despite the efficacy of the drums, the building of them was limited to Grade 5 and up which posed a problem as all learners can benefit from drumming, rhythm and movement. Rhythmania has taken up this challenge extending the workshops and courses from the drum to body work and various other percussive ideas. Please consult our Workshops page to find out more about our Training workshops. I originally studied through J.C.E and then furthered my studies at C.E.F.T. as a Senior Primary trained educator. I completed a B Mus (Hons) in Music Communication at Pretoria University in 2009. I have over twenty years of teaching experience ranging from Grade R all the way through to Grade 12 learners. Specializing in Guidance, I have always been aware of the emotional and social needs of the learners. I discovered through my own experiences that drumming was the key to many of those needs being met. Besides drumming, I play guitar and piano and have always been aware of the therapeutic value of music in general. I began drumming in 2004, and have been involved in drumming for remedial purposes, as well as for concert events at schools. I teach drumming at a school on a weekly basis to the Foundation Phase learners, and am involved in corporate interactive sessions as well as children's birthday parties. I played for a ten piece African percussion ensemble for 2 years, but have since left. My main focus is to reduce the stress and anger levels of the learners in our schools through drumming as a positive reinforcement, and to enable them to experience teamwork at its best. I feel that the educational value that the drum brings to our learners is invaluable.